Posted on Sun, Sep 19, 2010 : 2 p.m.
At 6:30 a.m. on May 18, I was headed down a hallway to the University of Michigan Cardiovascular Center. I had surrendered to medical technology and the expertise of hospital staff. An IV injection swept away nearly all anxiety, and I heard myself saying: “This is wild! This is wild!” Why did the idea of having my chest opened up in a few minutes seem peculiar — almost funny? Wheels rolled on floor tiles around me. Through the windows I faintly saw sun-streaked skies. My son walked to my right, silently staring straight ahead, while my wife and daughter followed behind with others who worked at the hospital. Their hushed conversations mingled with the smell of hand sanitizer. I wondered about touching light inside a tunnel, gazing down at those working on my heart or simply dreaming while drifting to oblivion. Death was either minutes away or a secluded inevitability. Oddly, either outcome was acceptable as my grip on place and time shifted. Nearby objects and people blended into curious focus. But I did not touch light, drift, dream or die after losing consciousness under the glow of operating room lights. Rather, in what seemed like moments, instead of 10 hours, I awoke in cardiac intensive care with a very annoying breathing tube down my throat. My heart had been stopped for more than two hours, repaired and restarted. What did it look and feel like beating inside my chest? Doctors and nurses had saved another life — mine. Was this my second chance? Just 21 hours earlier, around 7:30 p.m., my wife had driven me to the emergency room at the University of Michigan Hospital. I was experiencing severe pain in the middle of my chest and having difficulty breathing. Within minutes, electrocardiogram results and solemn looks on faces of emergency room doctors and nurses indicated very real heart problems. I was astounded to hear that I was probably having a heart attack. My mind folded inward. “Who, me? I’m only 59. I’m a healthy baby boomer and jogger. I don’t smoke. Is this the end?” My wife looked stunned, and a nurse came near, asking her to sit down. I felt disconnected, yet acutely aware of fragmented actions and swirling images. The room was cool and seemed to move in slow motion like the Normandy landing battle scene in Saving Private Ryan. My wife sat to my right and was talking, but her words trailed off: “Things will be alright.” Was she speaking for both of us? Two doctors — one older and the other younger — stood behind a nearby counter reviewing test results. Bright ceiling lights outlined their faces and moving lips. I received an injection in the arm. Doctors and other staff gathered in groups near the bed, warily glancing in my direction. Someone wanted me to take aspirin, while others said the situation was being monitored and I should try to keep calm. I looked through thin mists closing in around me. I was moved to a less busy area of emergency room where people carefully watched me amid flurries of activity. A doctor came to my left side, rubbing his hands with hand sanitizer and saying I needed a catheterization procedure to determine what might be wrong. There were numerous risks, of course, and he identified them. Not surprisingly I focused on the severest outcome: dying. As I peered out at this scene, death tended my deepest fears. It lurked around people and the medical technology and beckoned behind curtains separating me from mysterious sounds and conversations. The present became strangely irrelevant. Soon my clothes were removed. Someone helped me into a hospital gown and a warm blanket replaced chill as I laid back down on the gurney. Feeling increasingly detached from my body, I worried whether or not medical skill and knowledge could save me in coming minutes. This was an emergency and I never had a major operation so expectations were unclear. But I also anticipated that doctors, nurses and other staff knew what they were doing. There was no choice as I signed necessary permission forms. I had to have faith. Within minutes I was on my way to a catheterization lab. Urgency seemed all around as an intern walked with us and asked about classes I teach. I thought about pre-med and nursing students in my sociology courses over the years. It was comforting to have my wife of nearly four decades beside me, holding my hand. She tried to smile and wave goodbye at the door as I encountered a brightly lit room. Would I ever see her or our children again? Without delay, nurses prepared me for the procedure. I was heavy and cold on the table when a doctor entered the room and immediately asked me to lie still. An injection in my right groin area preceded slight pressure and I sensed a tube inserted under my skin. I wondered about blood. Another doctor arrived and for the next two hours, although it seemed like 15 minutes or so, blockages inside my coronary arteries were examined. Imagine that! They talked in soft tones as a drifting X-ray device moved right then left, up and down over my chest. Slight whirring sounds merged with awareness of two screens displaying my heart’s interior - eerily exposing hidden parts of my body. At some point a second tube was inserted near my left groin with much more pressure and considerable pain. I moaned as my head and shoulders rose off the table. Later I learned a balloon pump had been positioned in the aorta to help support my struggling heart. Eventually one doctor leaned toward me: “It appears that stents won’t solve your problem. It’s very likely bypass surgery will be needed.” The voice was calm behind a surgical mask, but her eyes seemed worried. My spirits sank and I thought: “I know people who have stents that successfully deal with heart blockages. Why can’t this solve my problem?” My sternum would soon be split down the middle. Would I survive this invasion? Around 12:30 a.m. I was moved back to a room at the cardiac surgery prep unit. My wife walked with me and noticed a crash cart just outside the door. Beige colored curtains seemed to float nearby. I was cautiously lifted onto the bed and a nurse checked various monitoring devices. As she changed the blood stained hospital gown someone asked about a power of attorney and living will. Why that question? I immediately became very conscious of a pumping sensation under my ribcage. It pulsated and seemed to gently crawl near the middle of my chest. I thought my heart was shutting down until the nurse assured me a balloon pump was helping circulate blood. Heartbeats were troubling and seemed amplified on a nearby monitor. Soon another doctor appeared to discuss bypass surgery, which, if I agreed, would take place around 7 a.m., earlier if needed. He listed possible problems, including stroke and death — but only a 5 percent chance of dying on the operating table. My wife nodded and seemed to understand. He also commended us for coming to the emergency room earlier that evening. “If you had waited much longer, say midnight or later, you probably would have died.” I thought, does he know about this thing creeping around inside my chest? My wife called our son and daughter (ages 25 and 21) again to tell them about this next step. I wanted to see them before surgery. They would try to rest and then drive over to the hospital around 4 a.m. The two of us continued talking while nurses regularly monitored my vitals before the surgeon’s 6:30 a.m. arrival. Around 6 a.m. the nurses started preparations for surgery and soon Dr. Prager walked through curtains. His friendly manner, explanations, clean white coat and tie soothed my worst concerns. He calmly reviewed procedures, as well as possible risks and complications. Since I was younger and in good shape I actually had a comforting 97 percent chance of surviving surgery . When I fully awoke in cardiac intensive care unit, I reached out to my family. Someone said it was nearly 6 p.m. As machines monitored my vital signs and heart rate, I wondered about seeing and touching the vertical eight-inch cut down the center of my chest. Might this thing break apart? People around me, including the hospital staff, were smiling, while tubes, wires and IVs exited my skin here and there. Yellow and red bodily fluids accumulated in containers hanging next to the bed and a bottle of hand sanitizer nestled in a holder near the door. It was still daylight and later I could see the university’s Detroit Observatory and construction at Couzens Hall across the street. Nearby buildings were being demolished just a few hundred feet from my room at the southwest corner of the Cardiovascular Center. Much happened during my eventful one-week stay in the hospital and throughout a multi-week recuperation at home. Care from hospital staff on Floor 4C, and in cardiac intensive care was superb. I will always cherish their concern, as well as their signatures on my heart pillow. At home my wife lovingly watched after me. We cried, laughed, talked for hours and slowly walked around our neighborhood. My son and daughter often sat near my bed and chair just chatting. My family’s concern sustains me. Experiences like these often bring families closer together. 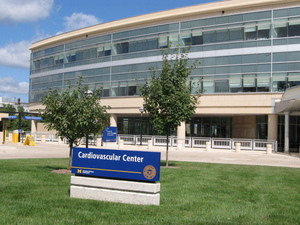 And under the watchful supervision of a supportive cardiac rehabilitation staff at the U-M, I am jogging again. Now that is wild! I am forever in debt to all those at the University of Michigan Hospital who made it possible for me to again walk into a classroom, savor cups of coffee at Expresso Royale, enjoy noontime Burton Tower carillon music and stroll across the Diag. Oddly these and other ordinary events seem novel, even exceptional. Visits, cards, phone calls and chicken soup from neighbors, friends, colleagues and family members lifted my spirits. My scar remains a constant sign of death defied and delayed. A strange lightness resides within as I imagine my heart still beating just out of sight. After showering each evening, I gently dry and press on my chest with a soft towel - closing my eyes and breathing deeply. The fragility and wonder of life silently surround me. 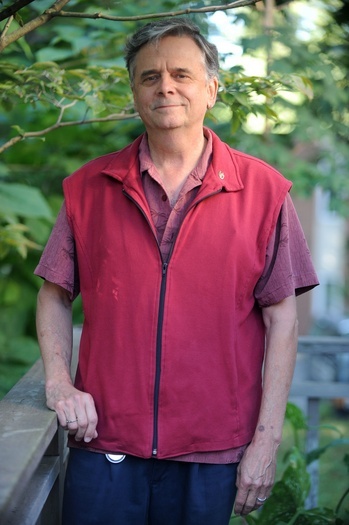 Dwight Lang is an Ann Arbor resident and Lecturer in the Department of Sociology, University of Michigan. He is a regular Contributor to Ann Arbor.com. Tue, Nov 23, 2010 : 10:51 a.m.
Thu, Sep 23, 2010 : 11:22 p.m.
Dear Dwight, Have you read Prevent and Reverse Heart Disease by Caldwell B. Esselstyn, Jr., M.D. http://www.heartattackproof.com/? This is a great read and heading the advise will very likely result in no further incidence of heart trouble. Mon, Sep 20, 2010 : 7:18 p.m. It was probably just a coincidence that Lang's story was published just as two men in college football had heart attacks, one fatal and the other milder than Lang's. Mon, Sep 20, 2010 : 9:07 a.m. I was recently diagnosed with a congenital heart defect that will require open heart surgery soon. I am a 58 year old male and had not been experiencing any symptoms. This condition was never found until a recent, routine exam. I have been getting opinions from heart surgeons about surgery and, if fact, just met with a surgeon at the UM, Cardiovascular Center last week. The thought of open heart surgery is extremely scary. Thank you for the first hand account of your personal experience which has helped to somewhat ease my worry.... best of health to you. Sun, Sep 19, 2010 : 9:10 p.m.
God Bless your heart, no puns intended. Be a good student and listen to your doctors. Welcome to the zipper club. The scar is often referred to as the zipper. Your story was amazing and well written. Thank you for sharing your experience. The zipper club. Sun, Sep 19, 2010 : 1:58 p.m. Thank you for sharing your experience with us. I am a nursing student and had my med/surg clinicals at the Cardiovascular Center. I thoroughly enjoyed my experience there. The staff there are wonderful, as you said, and I truly enjoyed hearing stories like your own from the patients.